With the Great March of Return protests entering their fifth consecutive week, tensions near the Gaza border continue to escalate as at least three more Palestinian protesters have reportedly been killed in clashes with Israeli troops. Palestine's Ambassador to the UN Riyad Mansour has lashed out at the ongoing killing of Palestinian demonstrators during Gaza protests, urging the UN Security Council to "take immediate action to ensure the rights of Palestinians are protected," according to Iran's Press TV news agency. "We will not leave a stone unturned. We have the right to demonstrate peacefully, to express our views and the large crowd of this week in Gaza — larger than last week — is a demonstration that the Palestinian people in a civilized, peaceful way, are expressing their opinion in the Gaza Strip, and they do not deserve to receive bullets for doing so," Mansour stressed. He blamed Israeli forces for "facing defenseless civilians and killing them as one would go hunting in the open fields." 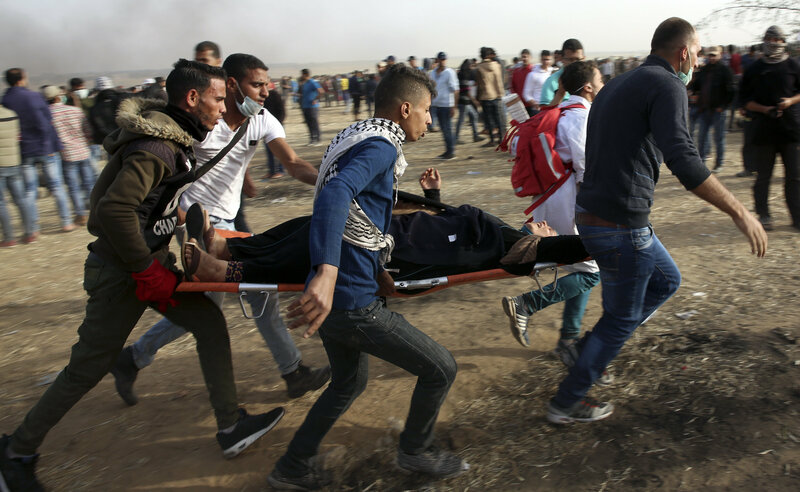 The statement came as Gaza officials said that three Palestinians have been killed and more than 300 others wounded in the ongoing protests in the area. Earlier, UN High Commissioner for Human Rights Zeid Ra'ad Hussein expressed concern about the growing number of victims and the excessive use of force by the Israeli forces during mass protests of Palestinians at the Gaza-Israel border. Hussein also voiced alarm about the reports of "unusually severe injuries" and Israel refusing permits to leave for those seeking treatment outside Gaza. His remarks came as the Israeli forces used firearms against the most aggressive protesters, something that Tel Aviv attributed to the need to protect the state border. Israeli authorities have repeatedly denied accusations of excessive use of force during the protests, ignoring calls for an international investigation into the matter. For five consecutive weeks, Palestinians have been staging border protests in a demonstration dubbed the Great March of Return against their displacement and the siege of the Gaza Strip. The protests are expected to culminate on Nakba day, May 15, the anniversary of the so-called "catastrophe" when millions of Palestinians had to flee their homes after the creation of the state of Israel. At least 42 Palestinians have been killed and 5,500 more injured during the past few weeks of protests, according to UN figures. The Palestinian Liberation Organization seeks the establishment of a state on the territories of the West Bank, including East Jerusalem, which is partly controlled by Israel, and the Gaza Strip. Tel Aviv refuses to acknowledge Palestine as an independent political and diplomatic entity, and continues to construct settlements in occupied areas, despite objections from the United Nations.